The high line models of 1951-1960's, Thin Model Touchdown, Snorkel, and Pen-for-Men are popular amongst collectors. Given the high volume of pens available, as of March 2010, this section is divided for the three featured pens, with Snorkel following TM Touchdown and PFM as usually the Snorkel section generally houses the most pens. Too, it is likely that at times no TM Touchdown pens will be available. Snorks now are sorted first into a cluster of "high-end" models followed by clusters based on color. I've been dabbling with a somewhat overwrought web-profile on Snorkel. Hard to squeeze in all the nuances best left to interactive discussion or to lengthy book chapters, but feel free to take a look. It needs major editing yet. Plonked between 1948-1950 "Fat" injection-molded plastic pens (Wire-Fillers, Lever Fillers and Touchdowns) and the nearly decade long run of the Snorkel starting in 1952, is the one year-ish model TM (Thin Model) Touchdown. The 1951 TM Touchdown looks like a slightly short Snorkel. The plastic cap looks like that of the Snorkel but has a flush white dot instead of raised white dot. Trim and model name differences exist. The metal white dot caps are identical to Snorkel's. TM Touchdown features partially transparent celluloid gripping sections, something not found with Snorkel. TM Touchdown can be found in colors never used for Snorkel, carrying over the colors of the original chubbier Touchdown pens from 1949-1950. TM Touchdown is well more scarce than Snorkel, but tends to fly a bit under collectors' collective radar. Touchdown Prussian Blue. 1951. Gregg (Writing School) Point with Marked Section. 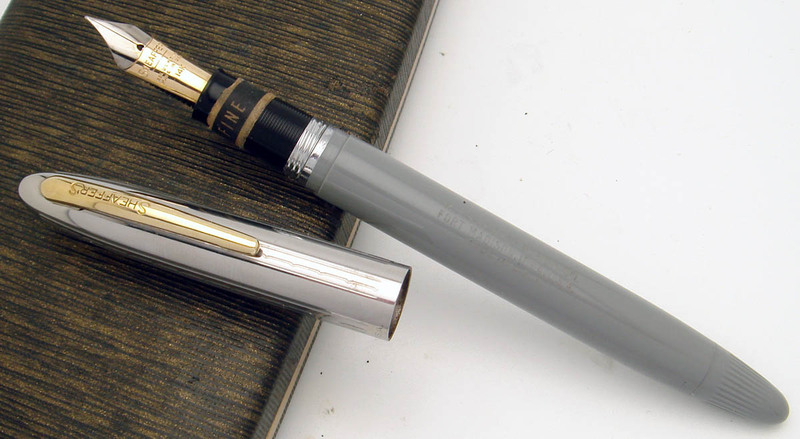 COMMENTS: With similar look to the subsequent Sheaffer Snorkel, theTM (Thin Model) Touchdown was a one year series, running between the 1949-1950 (fat) Touchdown series and the 1952-1959 Snorkel. The TM TD's blue was not used with Snorkel. This set is in clean shape. The cap-bands have personalization, obviously. The partially transparent gripping section (not found with Snorkel, of course) carries the double crescent Gregg Writing School Hallmark, indicating a Gregg point on the nib. PFM: 1959-1963 for most models, with stragglers through perhaps 1968. PFM is the "Fat" (Oversized) snorkel-filler pen, introduced about the time Snorkel, proper, was phasing out. 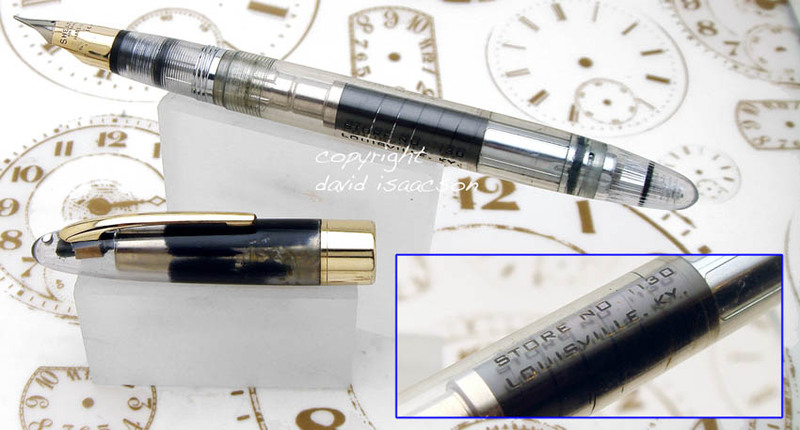 It intoduced the inlaid nib to Sheaffer's line, a feature used even today. COMMENTS: The PFM series is the oversized pen which employs Sheaffer's vaunted snorkel-filling mechanism. Most models/colors ran 1959-1963. Usually nice writers, these are a terrific choice or he who seeks a big gripping area. The tapered shell and lack of a step-off allow for very comfortable writing. This one is PFM I, the entry-to-series, featuring white trim and Palladium-Silver nib. Nice lightly used condition, with sweet fine point, a smooth wet writer. COMMENTS: The PFM series is the oversized pen which employed Sheaffer's vaunted snorkel-filling mechanism. Usually nice writers, these are a terrific choice or he who seeks a big gripping area. The tapered shell and lack of a step-off allow for very comfortable writing. PFM V was the top line model for most years in Sheaffer's catalogues. Gold-filled cap. Gold Nib. Bottom End Plate. This one is nice but not near mint. There is light wear to the cap and a few light marks to barrel. The bottom end plate is brassed, as is commonly seen on PFM IV and V. Nice writer. To start, consider some special and/or high-end models,and those with gold-filled caps, gold-filled caps and barrels, and solid gold trim. The high end comprises Crest, Signature, Autograph, Triumph and Masterpiece. 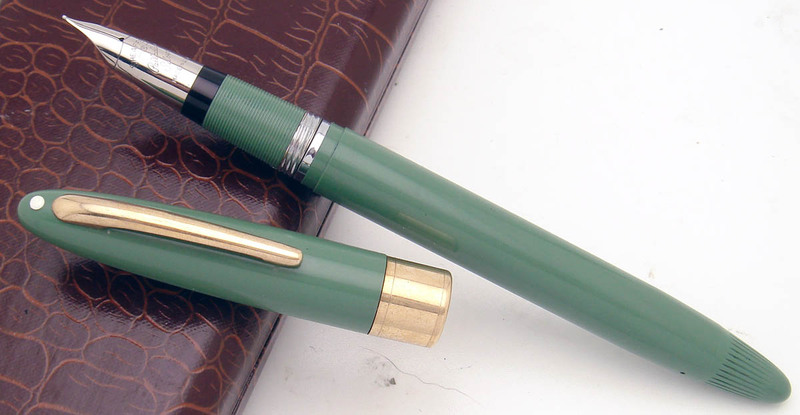 High end models are not always the most expensive pens today, as scarce color often outvalues fancy trim that contributed to high original cost. "Store # 1130. Louisville, KY"
COMMENTS: Snorks gave Parker 51 arun for the money during the 1950's. The true Demonstrator in practice was a clear Valiant model (plastic cap, White Dot, Triumph gold nib). Demonstrators are relatively scarce, as they were not offered for routine sale to the public. This one is nice. No fatal flaws. If had complete original black lacquer that covers the lower 60% of the cap, it woudld be the nearmint sort that pulls $650+. This one has nice fine point, with Sheaffer's classic upturned point. Hefty tipping material present. No internal cracks or stress marks, as are commonly found with these. Mechanism recently restored and works well. A brief interlude from stratification by original price point and by color, to peek at couple "Special Nib" pens. Most Sheaffer Snorkel nibs are firm Fine or Medium, some Extra Fine. Stubs and Accountant (ultra-fine , marked "A") nibs are well less common. Music Nibs (flex and firm), and marked Flexible nibs (lacking impressed divider line between the two metal finishes on the two tone nibs) are scarce and of high collector demand. I have a couple minty special-nib pens for your consideration. COMMENTS: The Thin Model (TM) Snorkel introduced in 1952, gave the Parker "51" quite the run for the money. Collecting interest in these has grown the past few years. This Pastel Blue Clipper is nearmint and still has a bit of the "stub" (nib grade) chalk-mark on the barrel. A one in fifty nib, this fat stub writes in italic fashion, offering shaded writing with thin cross strokes and fat down strokes. Today, with some exceptions, Snorkel color dominates value, usually overwhelming difference in model/trim. 6 colors are considered relatively rare and desirable: Fern, Periwinkle, Peacock, Mandarin, Fiesta and Vermilion. It is believed they were introduced just before the series discontinued. One can go to ten pen shows in a year and be lucky to find a couple-few amongst the hundreds or thousands of Snorks spotted. They command a price premium, though not in proportion to rarity vs the "common" colors. I'm happy to offer a quite nice array of pens. COMMENTS: Sheaffer's 1952-1959 Snorkel gave Parker quite the run for the money, reportedly outselling the "51" during that era. 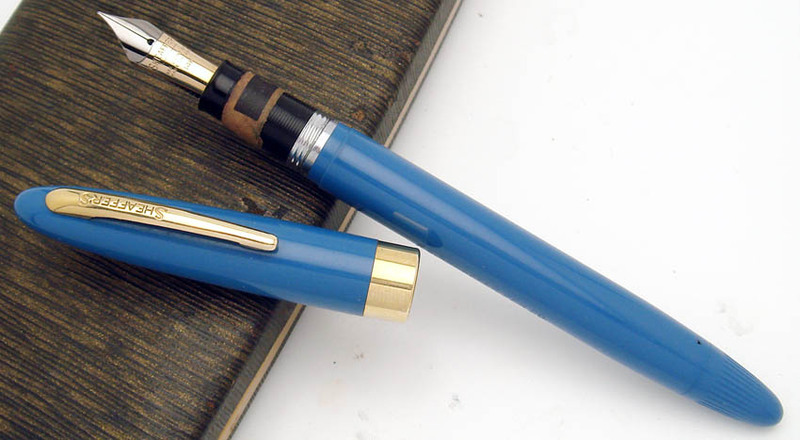 One of the most highly engineered fountain pens ever made, it offered more than a dozen models and a dozen colors during the course of its nearly decade-long run. Snorkel has moved way up the collecting food chain since I joined the hobby in 1998. The late Sam Marshall's article in 2002 was the first in depth treatment of that series. My find more than a decade ago of a hefty collection of the "tough" colors led me to make a market in the series for about ten years. The top six colors grow difficult to find. My personal collection includes about 15 of the best variants one can find. You are welcome to view my incomplete, though throrough, Snorkel guide done some years back. I really need to finish it. 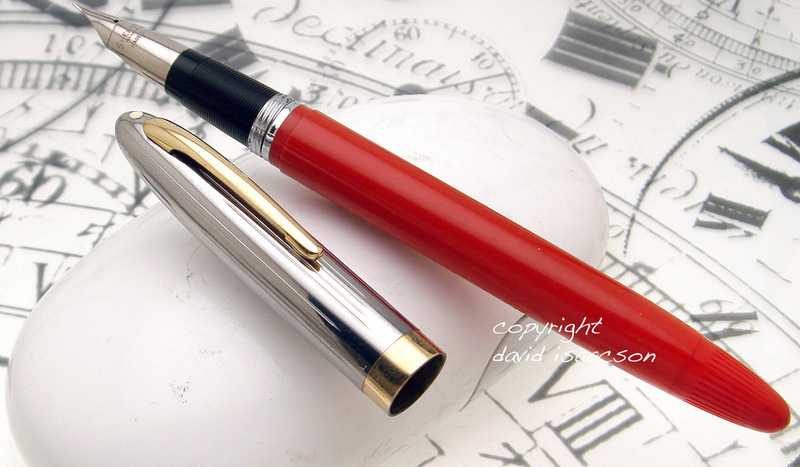 This one is Clipper (White Dot, PdAg Triumph Nib, Two Tone Cap) in the desirable Fiesta Red. It grades Excellent with minimal signs of use. cap is clean without any dings or dents. The Fine PdAg nib is marked with proper code F4 on back. Clipper: White Dot, 2-tone Metal Cap, Pd-Ag Conical (Triumph) Nib. COMMENTS: The Thin Model (TM) Snorkel introduced in 1952, gave the Parker "51" quite the run for the money. These two competitors dominated the American quality pen scene throughout the 1950's. A color of high-cachet, Fiesta Red looks like a mildly desaturated Vermilion. The intermediate level colors comprise Buckskin Tan (pink) and Sage Green. I do offer my observation, having hunted Snorks for the website in aggressive fashion for years, that Buckskin seems markedly more scarce than Sage. COMMENTS: Excellent Snork in a better color (Pastel Green is the common green). Smooth upturned (Waverly-style) Palladium-Silver nib writes a nice fine line, having recently undergone treatment by nib-meister Mike Masuyama. COMMENTS: The Thin Model (TM) Snorkel introduced in 1952, gave the Parker "51" quite the run for the money. Superb set in box (the "prop" box in the photo is included with this set). Pencil is mint. Pen is as-mint but has met ink. Less common variant with Sheaffer imprint on cap. Nice smooth wet line. Admiral: non-white-dot, plastic cap, monotone gold nib. COMMENTS: The Thin Model (TM) Snorkel introduced in 1952, gave the Parker "51" quite the run for the money. Superb set that has met ink. Smooth line is on the fine side of medium. COMMENTS: The Thin Model (TM) Snorkel introduced in 1952, gave the Parker "51" quite the run for the money. These two competitors dominated the American quality pen scene throughout the 1950's. Buckskin is considered one of the intermediate colors, along with Sage. My few years hunting Snorks suggests it gives "High Cachet" Fiesta a run in the rarity race and that it is well less common than Sage. Matching gripping section adds a bit of "oomph" to the look, though I am uncertain that Buckskin was offered any other way. Overall clean pen, there are (eep!) couple light toothies in the blind cap only. I downgraded pen from Exc+ (otherwise). So it goes. Nice responsive medium point, verging on a bit of tine separation with pressure, not enough though to bump label to "semi-flex"
Point: XF Imprint: Exc Size: 5 1/2"
COMMENTS: Sage Green is a middling color, well more desirable than Black, Gray, Burgundy, Pastel Green and Pastel Blue. This one has speckled brassing covering the clip, as per the picture. The back of the cap has a small (2-3mm) "flea bite" in the plastic. A bit unusual to my experience with snorks, this one has maker's imprint on the cap instead of barrel. Common colors include Black, Gray, Burgundy, Pastel Green and Pastel Blue. These are found in most models, both White Dot line and non White Dot line. Signature with solid gold band is found in Black, less often in Green and in Burgundy. Autograph is Black (?only?- I've heard of but have not seen Burgundy). Amongst the steel cap pens the least common model overall is the non-white-dot Sovereign. 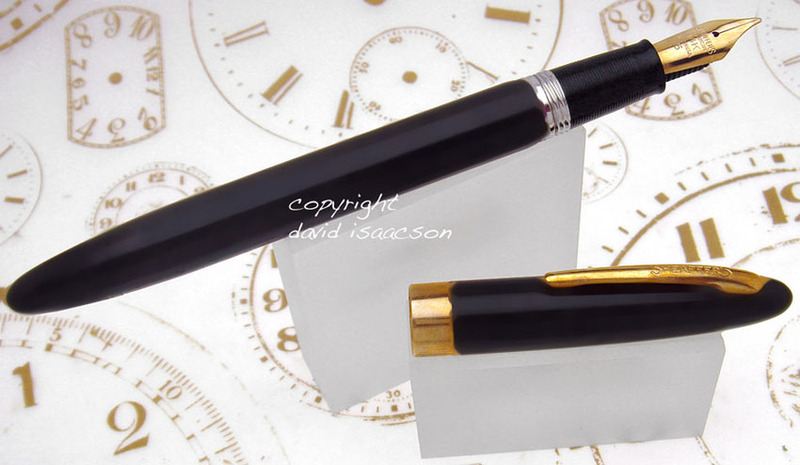 Pens are found with black and less commonly with matching gripipng sections. Matching sections and very early style solid-gold Snorkel tubes add a bit of "oomph" when found. Saratoga : non-white-dot, plastic cap, two-tone open gold nib. COMMENTS: The Thin Model (TM) Snorkel introduced in 1952, gave the Parker "51" quite the run for the money. These two competitors dominated the American quality pen scene throughout the 1950's. 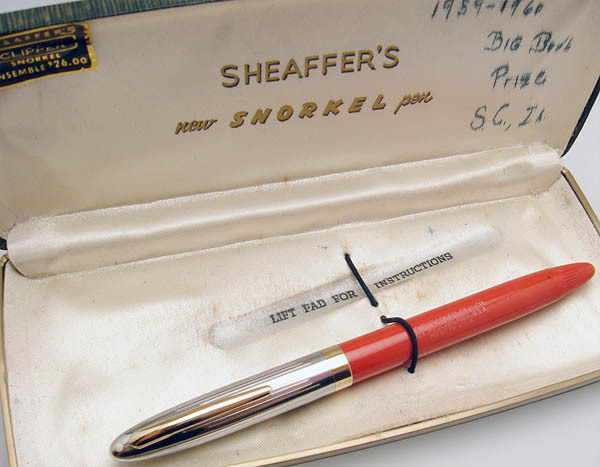 The Snorkel's filling mechanism in 1959 would find its way into the big Sheaffer PFM series. Mint pen has not met ink. Has nib-grade sticker still on gripping section. Nib is not marked for flex, but is at least semi-Flex (probably pushing full-flex for this era, but not as flexible as a flex 1920's pen, and the nib does not have "flex" code markings. May not be returned if inked or dipped. Can be resaced- with some delay in shipping- for additional $30. 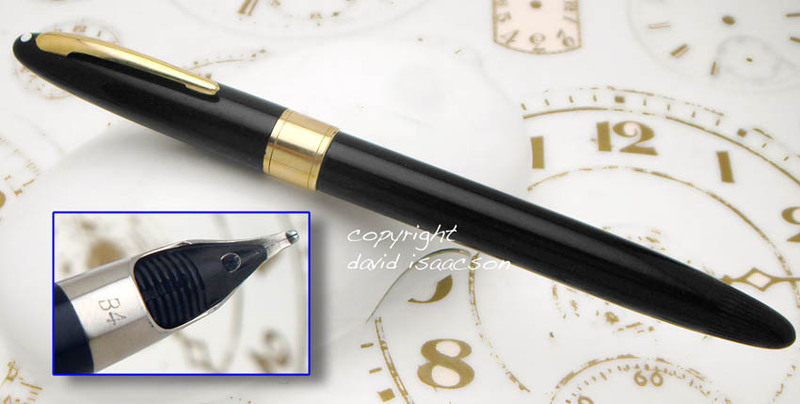 Sovereign : non-white-dot, steel cap, two-tone gold nib. COMMENTS: The Thin Model (TM) Snorkel introduced in 1952, gave the Parker "51" quite the run for the money. Sovereign is coming to be appreciated as a slightly better model, the top model of the non White Dot line, It's steel cap is well less common today than the White-Dot steel caps. Mint condition, dipping in water without ink traces. Superb in all respects. COMMENTS: Snorks gave Parker 51 a toe-to-toe run for the money during the 1950's. Clean Pen. 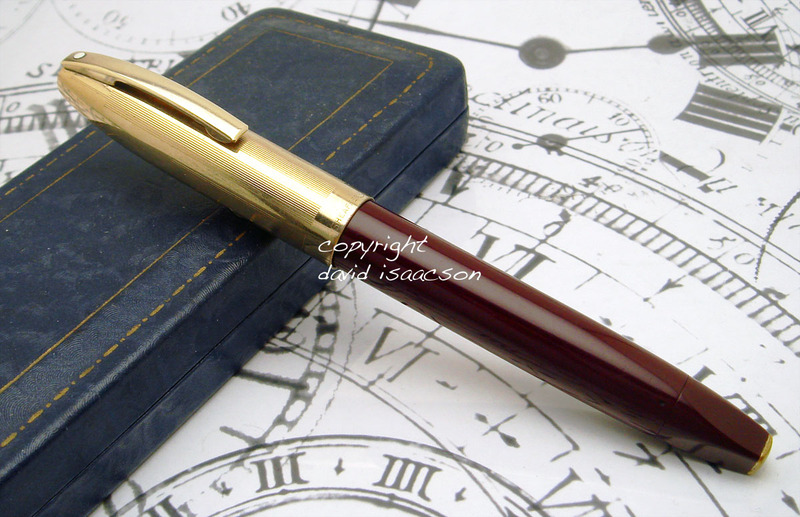 Nice writer with upturned Sheaffer "Waverley"-type point. COMMENTS: Snorkel (1952-1959) as Admiral had non White Dot plastic cap and monotone solid gold nib. It was the most affordable Snork with gold nib. This oen is clean and has responsive Fine-Medium point. Affordable Snork even today. COMMENTS: The Thin Model (TM) Snorkel introduced in 1952, gave the Parker "51" quite the run for the money. Mint with no trace of ink on water testing. Fully restored. Extra FIne nib with X-2 code appropriate to a monotone gold nib and with Extra Fine gripping section label intact. COMMENTS: The Thin Model (TM) Snorkel introduced in 1952, gave the Parker "51" quite the run for the money. These two competitors dominated the American quality pen scene throughout the 1950's. VALIANT features the conical two tone 14k gold nib. Nice wet fine-medium point. Bit of woggle to the nib from prior straightening. COMMENTS: Sheaffer's massively successful "51" fighter during the 1950's was produced in an impressive array of colors and trim. This one writes a nice smooth line with the expected two tone conical (Triumph) nib. 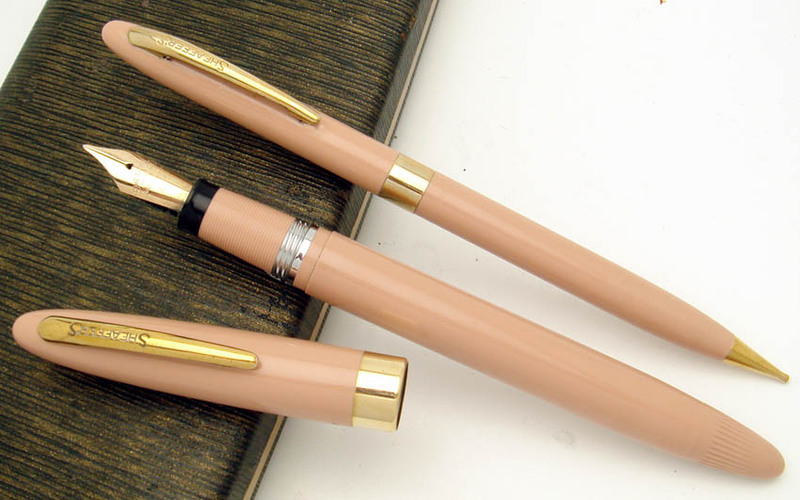 Pens with solid gold cap-bands are well less common than the average Snork. Cap-band personalized , in this case (lightly) Jesse Callen or some such. Plastic has light marks. Barrel imprint not present (never there vs. worn/polished). Priced down a bit to compensate. COMMENTS: The Thin Model (TM) Snorkel introduced in 1952, gave the Parker "51" quite the run for the money. 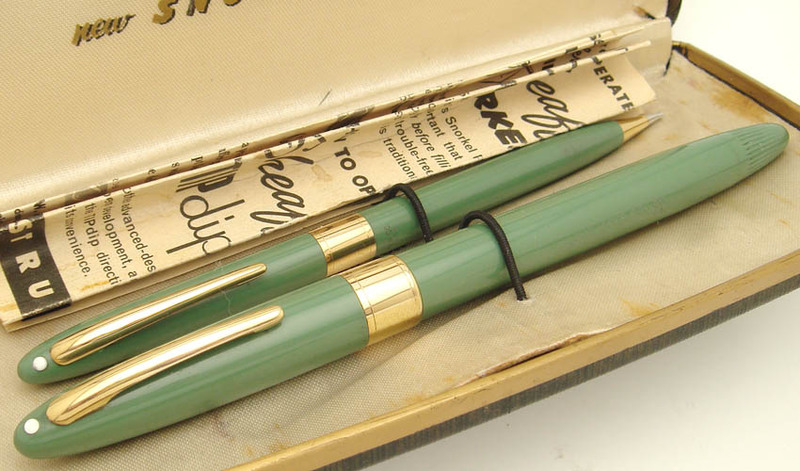 These two competitors dominated the American quality pen scene throughout the 1950's. 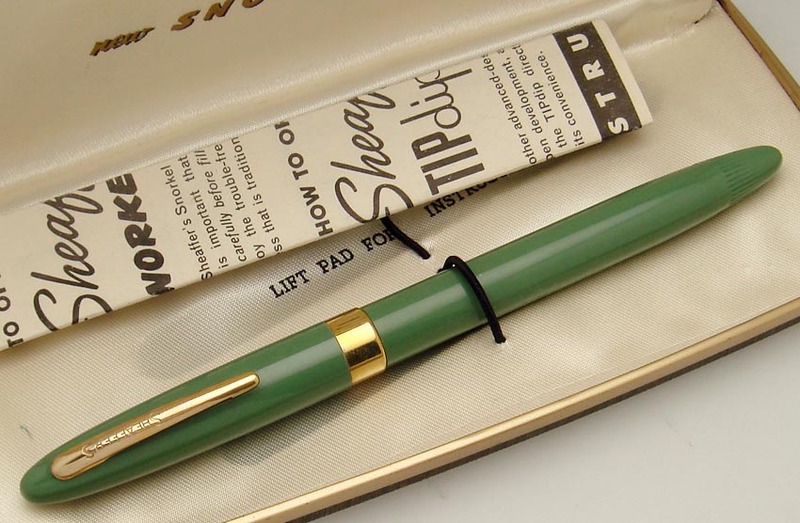 The Snorkel's filling mechanism in 1959 would find its way into the big Sheaffer PFM series. Proper PdAg Triumph nib. Barrel is personalized "J Ruth Renner"
COMMENTS: Snorks gave Parker 51 a toe-to-toe run for the money during the 1950's. The PdAg nib is the (?) later variant with "Palladium-Silver" in banner form engraved on nib. Super-fine point. Will ship mid June as wish to do final smoothening on the nib.